A usual perception that we live with is that raw food is healthy food. Nutritional content of fruits and vegetables is mainly assessed once they are harvested and those figures typically depict the item to be nutrient dense. The myth that cooking, mainly heating, destroys the nutrients in the food is still rampant. Part of this myth is in fact true cooking does affect nutritional content of every food item. Vitamins and minerals are the main components that are lost during cooking. Water soluble and heat sensitive vitamins are affected mainly. Average cooking techniques utilised at home lead to a loss of 15-55% of Vitamin C. Around 30-40% minerals are lost during cooking. Highest losses occur by squeezing after boiling and by soaking in water followed by parching, stewing and frying. Deep frying and barbecuing not only cause vitamin loss but also lead to formation of cancer-causing agents. Yet cooking is a highly necessary technique when it comes to improving palatability of the food. Eating cooked veggies is better than eating no veggies! Cooking leads to a limited loss of some nutrients and increases the bioavailability of other nutrients. Some cooking methods such as microwave cooking have minimal effects on nutritional quality. Are turmeric and black pepper’s benefits lost while cooking? What do other researchers have to say about this? So does loss of curcumin from turmeric mean loss of medicinal properties? What happened to the ‘Heating increases turmeric’s bioavailability’ notion? What about piperine in black pepper? No,w why am I suddenly concerned about nutritional losses occurring during cooking? 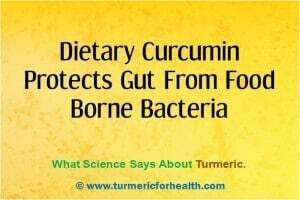 An avid reader that I am I keep stumbling across various pieces of information regarding turmeric and boy, they are confusing at times!! Now this my latest find: A research study was conducted to evaluate the loss of bioactive ingredients of turmeric, red pepper and black pepper namely curcumin, capsaicin and piperine. They were subjected to heat similar to those occurring in domestic cooking processes. They were either boiled for 10 or 20 minutes or pressure cooked for 10 minutes. Around 27-53% of curcumin was lost by heat processing of turmeric and major loss was observed by pressure cooking. Loss of piperine was around 16-34%. The study led to a conclusion that cooking spices lead to loss of their bioactive ingredients. Another study also comments on the same idea. This study demonstrated a loss of 85% of curcumin within 15-30 minutes of cooking. Also the loss of piperine was around 50-60% when black pepper was used as an ingredient of curry powder and this loss was reduced when only black pepper was used individually. Now this amazed me. Till date we have been suggesting various recipes to incorporate turmeric and they involve cooking…so do these studies negate our beliefs that cooking turmeric increases its absorption? Now there are a few things we don’t know about the studies like how was the turmeric cooked, whether turmeric powder was used or roots, were other ingredients included etc. So we cant completely accept or deny the results. But this gives us a basic idea that certain quantity of curcumin and piperine, active ingredients of turmeric and black pepper are lost on cooking. So, what’s next? Well we decided to put on our investigating feelers and detect what other studies say about the heat stability of curcumin and turmeric. Research proves that when using curcumin as a food coloring agent, the food processing temperature should not go above 190°C. An experimental study was conducted wherein the thermal stability of different natural yellow colorants used in food was studied. Temperature range was from 30-90°C and time for heat exposure was 6 hours! The color degraded with increase in temperature and curcumin was found to have intermediate thermal stability. So curcumin is not stable at high temperatures, but does that mean its pharmacological properties are lost? In fact, research proves that the antioxidant power of turmeric increases with boiling and roasting in comparison to raw turmeric. In a study, curcumin was roasted at 180°C up to 70 minutes. Its degradation products included vanillin, ferulic acid, and 4-vinyl guaiacol. When tested for its biological activity, 4-vinyl guaiacol increased antioxidant defenses by inducing activity of antioxidant enzymes and it also lowered the production of pro-inflammatory agents in immune cells. 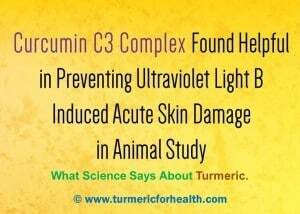 This shows that heat may breakdown curcumin but its anti-inflammatory and antioxidant properties are unaffected. When heated at high temperatures curcumin-alcohol mixture loses 47% of curcumin by weight and curcumin oil mixture loses 38.9%. Vanillin and ferullic acid are produced at around 50-60°C. Both of these products show significant anti-cancer activity. They also suppress the activity of nuclear factor-kappa B and COX enzymes which are key players in the inflammatory process. Despite turmeric’s low bioavailability, Asian countries have a lower incidence of cancer. Could this be linked to the inclusion of turmeric in diet and if yes does cooking modify turmeric’s anti-cancer activity. A study demonstrated that curcumin is broken down at high temperatures and one of its decomposition products are deketene curcumin. This compound is far more toxic to cancerous cells than curcumin itself. So cooking actually increases curcumin’s anti-cancer activity! Heat solubilized curcumin inhibits the formation of oxidation products by 80%. Curcumin in heated oil protects the liver from oxidative damage. Most studies investigate the effect of curcumin by exposing the cells to it but dietary turmeric can also reduce the risk of cancer. Hot water extract of turmeric is stronger than vitamin C when it comes to antioxidant activity. In fact, turmeric makes use of its antioxidant properties at high temperatures and prevents formation of oxidation products in foodstuffs at high temperatures. Including turmeric in food and cooking, it increases its bioavailability. A study evaluating this point, demonstrated the difference in curcumin’s properties when exposed to oil in water preparations. Temperatures selected were 30 °C and 100 °C to create conditions similar to that of salad dressings and cooking sauces. Interestingly, curcumin was found to be more soluble and stable in the preparations at 100°C rather than 30°C. Total curcumin available in the gastrointestinal tract increased as the oil in water emulsions protected it from degradation. This study depicts the idea that at higher temperatures curcumin is made more bioavailable. The solubility of curcumin in water is proven to increase by 12 folds and turmeric by 3 folds when it is heated. A study shows that heat solubilised curcumin can prevent antibody-antigen binding a hallmark of autoimmune conditions and in this study, curcumin was boiled in water for 10 minutes but it still showed pharmacological action. So these studies do depict that curcumin’s bioavailability increases with heating. Flavor of black pepper, that is mainly loss of piperine, is lost due to heating and cooking within a range of 50-120°C. Hot water extract of black pepper prepared by boiling black pepper in water demonstrates the antispasmodic effect. In a study among the various spices tested, black pepper was the only one that showed an increase in antioxidant activity on thermal treatment. Various cooking methods such as pan-frying, deep-frying, roasting of meat can lead to the formation of carcinogenic compounds and research suggests that the application of black pepper during processing can reduce the production of such compounds. Drying black peppercorns at 70°C for 30 minutes or sun drying can lead to degradation of carcinogenic compounds like safrole. The purpose behind presenting these points is that heating may lead to loss of piperine but it also destroys the harmful content of spices. Also, pepper still retains its biological properties despite heat treatment. When cooking sprinkle turmeric in the end to avoid loss of curcumin. Reduce the cooking time when you use turmeric. Cooking turmeric with oil can help protect it from degradation and increase its bioavailability. Use turmeric in gentle cooking methods for example while making soup and steaming vegetables. Also, make sure you consume the liquid resulting from steaming as it would contain the curcumin that is lost while cooking. Add turmeric to food items that do not require to be heated. For example, buttermilk increases stability and solubility of curcuminoids. Marinate your meat prior with turmeric if you plan to barbecue it to avoid the formation of carcinogenic compounds. Make use of the ‘Golden Paste’ as it cooked on low heat with turmeric and pepper. Use fresh black peppercorns while cooking. So it is true that curcumin and piperine, active ingredients of turmeric and black pepper are lost when heated. But the good news is that the pharmacological properties are not lost. Spices are heat resistant. Back in India spices are dry roasted before using them in food and sometimes they are even sun-dried to get rid of toxins and bacteria. In the case of turmeric, the degradation products show equivalent or better action than curcumin. And pepper can lose its flavor by storage and grinding just as it would occur during cooking. So you don’t need to worry about whether you will lose all the healthy stuff from spices when you cook it. Hi. It’s a great practice since turmeric is oil soluble and is better absorbed in the body when taken with fats. Hi Iswarya. Since you don’t have an option to boil turmeric, you could consider taking it directly with milk. I’ve just added a teaspoon of turmeric to my boiling pasta water not knowing though if it’ll make me good or bad. For my daily smoothies, the night before I steam beets, carrots, turmeric, peppercorns for 5 minutes; then I add kale for 2 more minutes and refrigerate overnight. I toss the liquid in the water because of something I read. What do you think of the times and not using the water? If you can befriend someone from Africa raised in a tribal village near a jungle, they have first-hand info on tried-n-true methods for preparation and use of so many awesome plants, herbs and veggies. I have such a friend, and she recommends raw turmeric cut up into chunks, soaked in cold water over night, and then boiled in hot water to make a tea, of which you should drink one mug a day for help with pain, inflammation, cancer, depression, prevention of flu, and many other benefits. “you don’t need to worry about whether you will lose all the healthy stuff from spices when you cook it.” This conclusion does not consider the volatile compounds! Hi, this was very helpful, thank you! I was actually looking for this information regarding ginger…I’ve been making my own ginger ale, and to make the ginger syrup. You have to boil the water, ginger, and sugar for around 15 minutes. Would you assume the same would be true for the anti-inflammatory properties in the ginger? Hi. We have not researched much on ginger’s active constituents (especially gingerol) with respect to heat stability and solubility. But hot ginger tea is used for therapeutic purposes in Ayurveda and Traditional Chinese Medicine. It perhaps stable at temperatures up to 100 degree Celsius and has some unique degradation and transformation reaction at high temperatures. But to keep it simple hot water extracts of ginger or ginger tea is therapeutic especially for treating pain, inflammation, malaise, flu, nausea as per traditional medicinal practices. Would baking turmeric and pepper in a recipe for 15 to 20 minutes at 350F (177C) negatively affect the benefits? If it does, would increasing the amount help overcome the loss during baking? e.g. 2X the amount? Thank you. Hi. The post pretty much highlights the concern of thermal stability of curcumin. Also in the article it has been pointed out that despite of low stability, if curcumin is mixed with water then it is more stable at high temperatures. So when you consider a process like baking and its effect on the benefits of turmeric and pepper, apart from time and temperature the other ingredients in the recipe are also of concern. 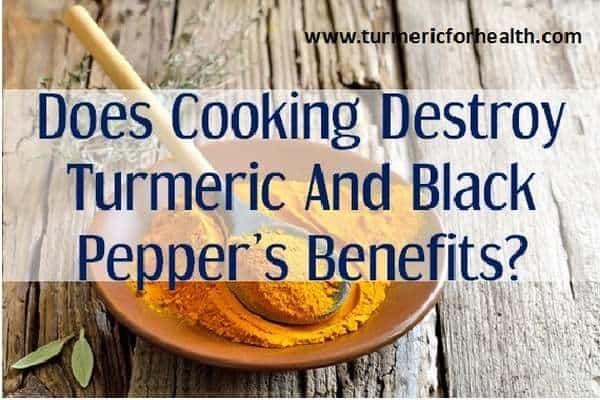 For example if there is meat or oil in the recipe, turmeric and black pepper will be involved in reducing carcinogens and improving antioxidant capacity. Perhaps if you were to test the food item, there may be a loss in the active ingredients but definitely the above mentioned parameters (carcinogen and antioxidant) would have improved. Most of the Indian recipes involve adding spices in the end or cooking it with oil in the beginning, but turmeric and black pepper is used for marination in Indian recipes that are grilled or baked at high temperatures so there is a chance of loss or transformation of active ingredients. But that definitely does not mean there is a loss of benefits. Increasing the amount may affect the taste of your recipe and may not counteract the heat degradation. If you intend to get that extra dose of turmeric, you could perhaps include a side dish or salad dressing where turmeric, black pepper and fats are used without heat. I adjusted my recipe to bake my dessert at a lower temperature (240F/115C) for about 12 minutes and do not have the opportunity to add at the end of cooking, nor consume turmeric in any other way. Is that a low enough time and temperature to reduce the loss of the curcumin/turmeric and piperine compounds? Also, would I include about 1/4 tsp turmeric powder per serving in the recipe plus a similar weight of coconut oil plus some freshly ground black pepper be the right amount to use in the recipe? Hi. Yes the temperature and time seems appropriate to minimize the loss of curcumin and piperine based on research evidences we have come across. Even the aroma and taste of the final product will be indicative of the presence of turmeric and black pepper. We have across many baking recipes that utilize turmeric and the final product still retains the beautiful orange yellow hue that is indicative of the retention of curcumin. So please don’t worry about heat loss of curcumin; it will definitely retain health benefits. Also yes 1/4 tsp turmeric powder with 1/4 tsp coconut oil and a pinch of black pepper should be sufficient. You can skip the black pepper if including coconut oil. Also if you are using dairy or any other type of milk you could still expect the milk (along with the food matrix) to aid in absorption of curcumin. Hope this helps. Hi, thanks for this. I’ve been boiling fresh turmeric & ginger for 10-20 mins then add pepper & coconut oil at the end. Now I am concerned/wondering if this is the best way to imbibe turmeric or not really ??? Thanks! I put a tsp. Of tumeric a sprinkling of pepper in 1/4 cup flour mixed with buttermilk for pancakes….would this be an alright way to consume tumeric? Yes, that is a great way of adding turmeric to your daily diet. Black pepper as well as buttermilk fats aid in absorption of turmeric. Dietary turmeric is the best way to take turmeric for general health. However if you are looking for a more therapeutic effect, then we would recommend taking golden paste. 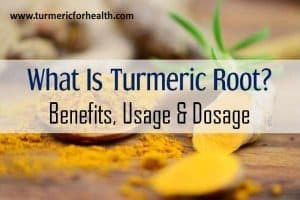 If I simply boil tumeric root and only drink the liquid, am I getting all the benefits of curcumin? But the best way of taking turmeric powder is with black pepper and oil. I’m confused. The conclusion specified black turmeric. Does this then extend to yellow turmeric – the stuff we usually think of and what is used in India? Thanks for the heads up. Its a typo but revised it. Its regular yellow turmeric. I put for lung cleaning every day, 1ts caron tree extract, 1ts turmeric powder, 1ts ginger powder, little black pepper, little olive oil.? and then mix it all, enough for best absorbtion? or what i can do more??? Yes this mixture is fine. If need be you can cook this mixture prior to consuming it. Hi, Tumeric is prepared in a traditional Indonesian tonic drink called ‘Jamu’. The drink is quite thick, using a large amount of tumeric root, tamarind, sugar & salt. It is simmered gently for an hour or so. I have been drinking this regularly, but have been wondering whether the curcumin would be broken down by the cooking process. Your research indicates that it is, but that the products it degrades into are as beneficial. What are your thoughts? I probably drink about 50ml per day, which is probably about 10g of tumeric root based on the quantities that the lady who makes it says she uses. Would be interesting to see whether the other ingredients in the Jamu contribute to bioavailability too! Curcumin would degrade at a temperature higher than 100 degree Celsius and yes research suggests that it breaks down into therapeutic components. However it would be difficult to comment on what would be the result of boiling turmeric root in water since traditionally people do boil fresh turmeric in water and drink it for relief in pain and cold. In fact turmeric or curcumin boiled in water increases its solubility in water by 9-12 folds. Jamu is a herbal concoction and if it is being prepared by traditional techniques then it must be taking care of the absorption and health benefits. It would be indeed interesting to know its other constituents say if it contains ginger then yes that is helping in the bioavailability. I have been having raw turmeric with mustard seeds, how much quantity should l be having each day? Also if I boil fresh tumeric in water & have instead of milk has it got the same effect? 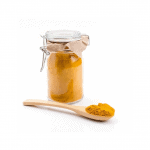 Raw turmeric can be consumed at about 1-3g a day…say maximum would be an 1 inch long piece of the rhizome. Anecdotal evidences suggest that boiling fresh turmeric in water is beneficial but research shows that curcumin, one of turmeric’s active ingredients, require black pepper and fat for absorption. In milk, dairy fat helps in the absorption but interestingly turmeric tea (involves boiling turmeric in water) also helps in cold and cough. Boiling turmeric in water will have benefits but it would be difficult to comment which is better. I add my tumeric and pepper after my food is cooked and on my plate. Will this affect the degradation of both? Adding to turmeric and pepper to your food after it is cooked is absolutely fine. It will not affect the benefits of the two. Nutritionists ‘discover’ the benefits of ingredients by observing how different cultures benefit from them. Do they incorporate the actual use and methods into their ‘discoverites’? Nope. Adds for ‘buy my cinnamon’ used to tout only that company’s special source (a remote place of course) as to why you should pay more. Use common sense. If thousands of years of human experience with a particular food item result in an overall benefit to that group – hello? – whatever they are doing worked. You don’t need research. It’s good to know these technical truths … but not necessary. Case in point: Most cultures that use garlic – Italy for sure – whack the garlic A LOT before they put it in the meal – just before, too. Scientific American I guess two decades ago had an article in which they whacked some garlic, put it inder a spectrophometer … 20 or so times in a row … and published the molecular structure after each what. Lovely article that. After each whack, more allison existed. The old country gets it right. And having whacked it leave the garlic for ten minutes before cooking it. this enhances the healthy allicin and makes it more resistant to heat damage when cooking. Is it true that turmeric powder is beneficial in lowering blood pressure? What i do is take all the above in small pieces plus whole peppercorns and put in a spice grinder, and then have 2 tsps a day, my blood pressure is a lot lower[was high] and im feeling stronger.im 64 and a smoker and have 4 beers a day, but i feel very good, Now to give up smoking!! Interesting read, Thanks,although ive been a smoker for 50 years,never a heavy smoker though,Here i smoke the local grown un-treated baccy,30 cents US for 2 oz, no added chems like the big companies,I had my bi-anual health check in March this year,ECG, Complete blood Test, both normal & a chest x-ray, clear! I have my own blood pressure digi machine & blood glucose test kit,but i hardly use them now because i know tumeric and other spices are looking after me! keep up the good work,great articles.. Thank you for your appreciation. It is great to hear about your health and also its amazing to know how you use spices to maintain your health naturally. Try the book Allen Carr’s Easy Way to Stop Smoking. It’s available on Amazon and has helped many people (including me!) quit for good. Keep trying!